Walter H. Kressin, 45, is the proprietor. Oscar Maerzke formed the company in 1896. In 1920 he went into partnership with the late Charles Lutovsky, former mayor. In 1920 Lutovsky bought out his partner. Kressin and his associates took over the company in 1929. Also some about the stuffed goose business. Watertown Republican, page 5. A consignment of 600 squabs was sent to Milwaukee this afternoon and will be used at the banquet given President Roosevelt at Milwaukee tomorrow evening. The birds were selected with especial care and netted the shipper a handsome return. The fame of Watertown squabs, like Watertown stuffed geese, is becoming national. One of the largest concerns of its kind in the Midwest, the Watertown Squab Co. is in the middle of its production season now and is headed for a probable output this year of 65,000 young pigeons. The company – it’s really a small farm — operates on a four acre layout on the north side of the city. Of its average annual output, 30,000 of the young birds are marketed in Milwaukee, at least another 30,000 go to the Chicago and eastern markets and the rest to miscellaneous customers over the country. The company, founded in 1896, is the largest of its kind in Wisconsin. Other production centers are in the east, south and in California. Walter H. Kressin, 45, is the proprietor. Oscar Maerzke formed the company in 1896. In 1920 he went into partnership with the late Charles Lutovsky, former mayor. In 1920 Lutovsky bought out his partner. Kressin and his associates took over the company in 1929. To supply 65,000 squabs a year means turning out about 200 butchered birds daily, Kressin explained. Squabs are raised until they are about a month old. Then they are butchered, the feathers picked and the birds placed in ice water. After another washing and immersing in a second tank of ice water, the squab is given a final cleansing, packed in ice and sent to market. They are graded according to color and weight. The squabs are kept in small coops and not allowed to use their wings. This makes the meat more tender, Kressin said. Squabs, if kept over four and a half weeks, are classified as pigeons. Those that are raised to be pigeons on this farm are principally the White Kings and Silver Kings, with some Homers interspersed. The pigeons are mated selectively; that is, the types of pigeons that have been found to be producing the best squabs are used for breeding purposes. About 4,000 pairs of pigeons are kept here for breeding. Each pair produces an average of 14 squabs a year. The mother pigeon lays one or two eggs, and with the help of the male, hatches them in 17 days. When the young are three weeks old, the parent pigeons build a new nest for the next eggs. Tobacco stems are kept in the pigeon coops so the birds can build nests with them. The sterna discourage insect pests and make a soft, clean padding for the young. After the parent birds have fed their young for seven to nine days, the squabs are fed a wet mash daily until prepared for market. “The pigeon is an unusually clean bird.” said Kressin. "It takes a bath often and keeps itself scrupulously clean all the time." Both Kressin and his assistant, John Heiden, work long hours to keep pace with orders. They haven’t had a Sunday off in months. One reason is the difficulty in getting help Kressin said. They have one helper, Thader Wille. This farm a decade ago did a business of 100,000 squabs a year, but sales fell off during the depression and haven't approached the 100,000 figure since. Walter H. Kressin, 1012 Labaree Street, last night was approved by the Board of Police and Fire Commission to be the city’s new park policeman. He succeeds the late Glenn O’Brien. He was recommended for the position by Chief of Police Theodore C. Voigt from a list of men who were under consideration. Mr. Kressin will begin his duties on May 1, the board reported this morning. Mr. Kressin is a driver for the Wisconsin Transit Lines, Inc., operator of the Watertown bus service. At one time he was associated with the Watertown Squab Company. Arthur W. Kehl, 1400 North Second Street, today was named to serve as one of the judges for the Wisconsin State Pigeon Club’s first annual show' to be held at Kohler, Wis., Dec. 4,5 and 6. He will judge the fancy breeds. The state show will have between 1,750 and 2,000 entries. In addition to its reputation for stuffed geese, Watertown was famous as a national market for squab. In the 1930s more than 100,000 top quality squab were supplied annually to eastern and local markets by the Watertown Squab Company which a operated for more than 50 years with a national reputation. The company grew out of a concern founded by Oscar Maerzke in 1897. In 1910 Maerzke took in a partner, Charles Lutovsky. Ten years later Lutovsky bought the business. He had arrangements with area farmers to pick up the squab (young pigeons) on regular routes. On Mondays he would set forth with a crate in his buggy to pick up squab in the Clyman area, on Wednesday he went to Lebanon and on Fridays he collected squab from Concord and Johnson Creek farmers. The squab received a grain formula at regular intervals to prepare them for market. When Lutovsky was elected mayor of Watertown in 1930 he sold his business to his partners, John Heiden and Walter Kressin. They formed the Watertown Squab Co. Walter Kressin, was the last owner and manager of the company. The Watertown Squab Co. had the reputation of producing some of the finest squab in the United States. The company had four 120 foot barns in the 1100 block on North Fourth Street, built off the ground with enclosed flying space. Between 5,000 and 6,000 squab were sold annually in Watertown. Many persons will remember the popular squab dinners at the Buena Vista House and at the Oconomowoc Lake Club. Kressin kept 3,000 pigeons (White and Silver Kings) for breeding purposes. Their feed was a grain mixture of corn, wheat, hemp, buckwheat, sorghum, and peas, with about a ton and a half of grain used each week. After 50 years of popularity in eastern and local markets the demand began to drop off in the late thirties and early forties and the business was gradually phased out. An article in a Watertown Republican edition of the 1850s noted that "pigeons are now plentiful in the woods, large flocks are continually flying all directions. Sportsmen are getting their fair share of fun and games.” Sportsmen got more than their fair share. These were the now extinct Passenger pigeons of history. No danger of that now for pigeons, are treated with respect by members of the Watertown Pigeon club, organized in 1936 by Arthur Kehl, Howard Kramp, Dr. A. W Breithaupt, Walter Schwenkner, Thomas Nack and Paul Wiley. After 45 years, Kehl, Nack and Schwenkner are still active in the club. 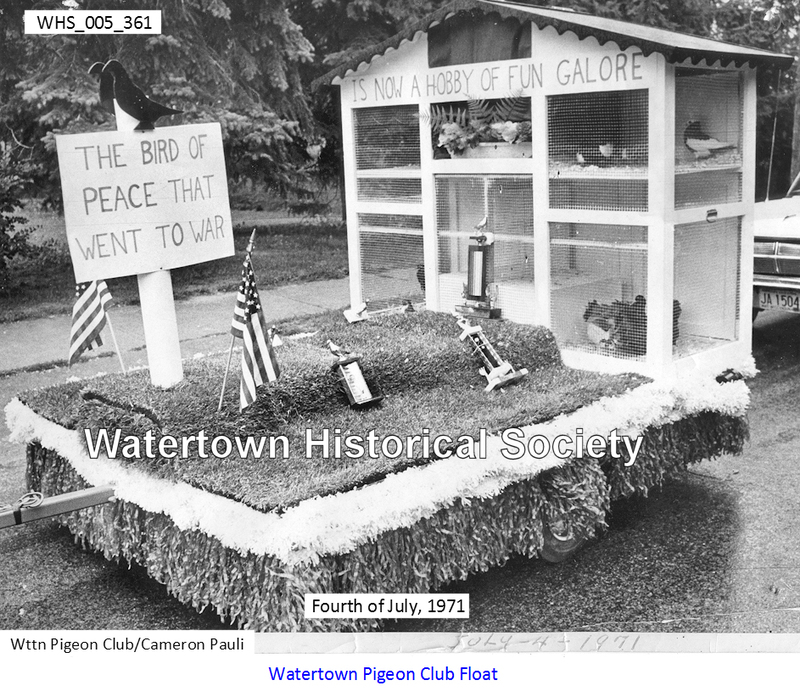 The organization of the Watertown Pigeon Club was held in the men's reading room of the public library, exhibitions were planned for that same year. The first pigeon show was held at the Wertheimer building, Main and South Fourth Street, with 270 entries, including 42 varieties of show pigeons. By 1950 the pigeon shows were attracting over 1,000 entries from 20 states. Kehl was named to the United States Pigeon Hall of Fame in 1949, and has served as show secretary for many years for both the local club and national association shows. Walter H. Kressin, 82, 1012 Labaree Street, died Wednesday at the Watertown Memorial Hospital. He was transported to the hospital by the EMS vehicle. Funeral services will be held at the Schmutzler Funeral Home with the Rev. Orlo G. Espeland of Immanuel Lutheran Church officiating. Burial will be in Immanuel Lutheran Cemetery. Kressin was born Nov. 3, 1896 in Watertown, son of the late Mr. and Mrs. Herman Kressin. He was a lifetime resident of Watertown. On Sept. 19, 1921, he married the former Eleanora Wille in Watertown who preceded him July 24, 1969. He was the owner and operator of the Watertown Squab Company. He drove the City Bus from 1947 until his retirement in 1961. Surviving are one son, Roger of Watertown, and one sister, Mrs. Ida Saum of Watertown. He was also preceded in death by six brothers, four sisters and one daughter.